I make stuff. Skincare products, educational activities, craft projects for the home, humans. I do it all. And when it comes to Pinterest, I haven’t had a fail yet. So it should come as no surprise that I would try my hand at making toys for the little she babe. She’s been teething a little bit over the last month but nothing beyond some congestion that had her up more than she already is at night. I’m hoping any pain will be non existent or minimal like it was with her big brother. We never knew he was teething until teeth began to show up. He was so chill with it. 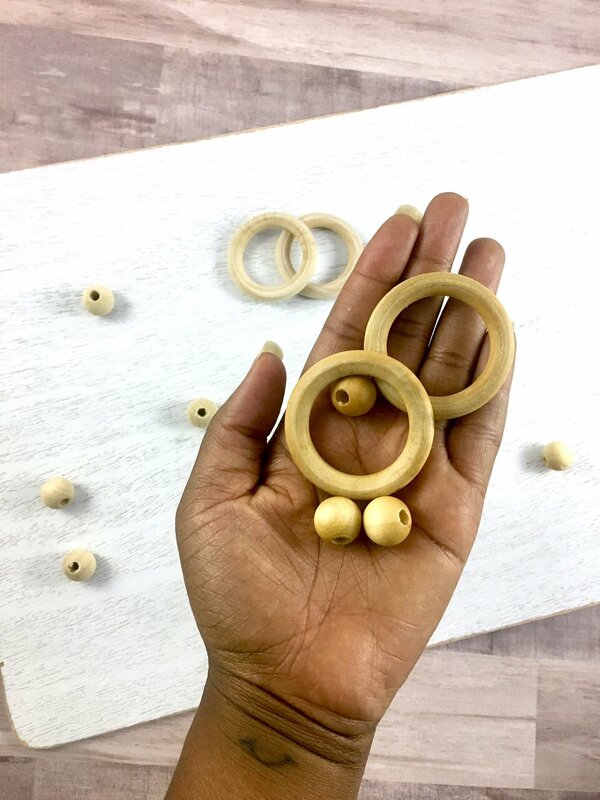 But just in case, I decided to whip up these cute little teething/texture exploration rings (I made that up but you get my drift) to go along with her squeaky giraffe. 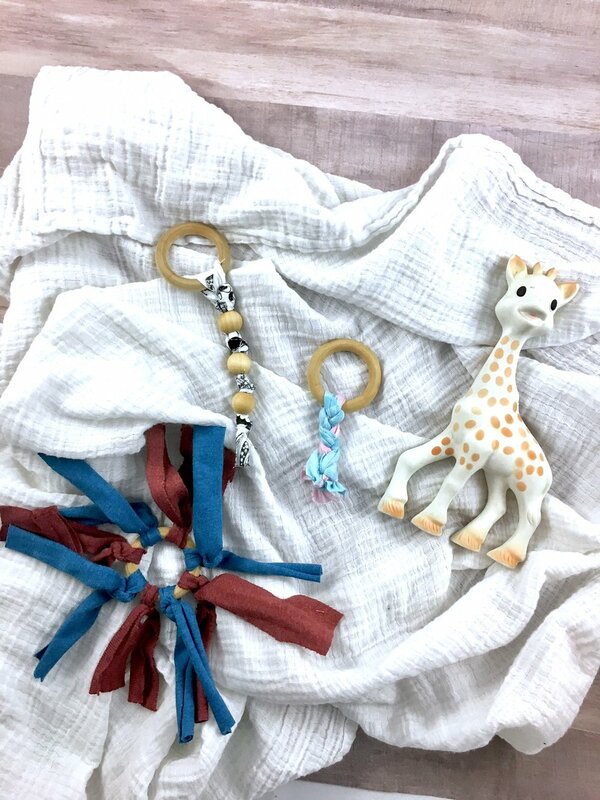 These teething rings were fairly simple and cheap to make. 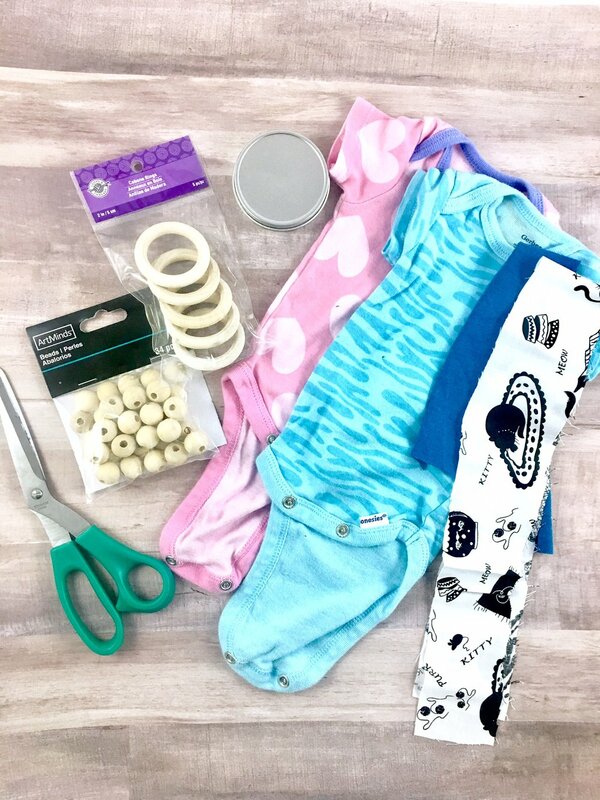 Using a few supplies I purchased from Michael’s and some fabric from my sewing days and her outgrown onesies, I knocked these out in about 30 minutes or so. I spent way more time taking pics! I kept it simple. You can definitely use whatever fabric you decide, but I prefer the jersey material of t-shirt for any braided or twisted rings it will braid or twist fairly tight. While a stiffer cotton fabric such as that used to make a button down blouse for anything beaded. The friction along with the knotting will help keep the beads in place. These are just some of my variations using the fabric but I’m pretty sure you could come up with more of your own. But don’t hesitate to give these a try. I started by oiling all of the rings and beads that I would be using for a total of 3 rings and 3 beads. Next I cut strips from the various fabrics in 12 inch length and 1-1.5 inches in width with the exception of the onesies. I cut as long of a piece I could get from each onesie resulting in 3 strips from each. Could of gotten more but the backs of both had some minor stains (poo blowouts) so I could only use the front. Starting with the first ring with the beads, take one end, wrap it around the ring, tie, then knot it once around one of the wooden rings. Then with the tail end of the shorter piece, wrap both pieces together so it looks like one as you go to pit on your first bead. It will be a little snug but keep guiding it through bit by bit. Once the first bead is next to the first knot, make another knot next to the bead. There should be no room to move around. Repeat 2 more times with the last two beads making knots between each. Although the holes make sure the fabric is pretty snug, the final knot should be tied at least twice if not more as an added safety measure. For the second one, I used the fabric from her onesies and did a simple braided style. Using the same technique from the first, I took two pieces of fabric, wrapped, tied and knotted them just as before. Now this will leave you with four strands of fabric. I grabbed two strands together and off to the right while leaving the other two out in order to began to braid them together. As I approached the end, I knotted it twice to keep it from unraveling. For the final one, I just kept it free form so to speak. I wrapped, tied and knotted each piece of fabric just as before but this time just left them free. I just alternated the fabrics thus also alternating the textures and colors. You can oil the exposed portions of the wood periodically as well. This was a fun simple project for my little she babe. I love creating things for my kiddos. Its one of the ways I show love. If I make you something, food, jewelry, anything, just know that means I truly care. But its also a stress reliever. Working with my hands in some capacity allows the process of it all to calm my mind and face an issue more calmly later. Whatever your reason for making them, besides the obvious, go forth, have fun and be creative! !